Minneapolis, St. Paul and several suburbs have declared snow emergencies. The sun briefly came out late Monday morning as winter storm warnings gave way to windchill advisories and a temperature free fall was about to begin. Actual air temperatures will fall below zero Monday night and remain there through until Friday morning, with near record lows close to minus-30 degrees expected by midweek, the National Weather Service said. Adding to the misery will be dangerously low windchills on Tuesday night through Thursday morning approaching minus-50 to minus-65 in the metro area and across east central, south central and southeast Minnesota, weather service said. “The dangerously cold windchills could cause frostbite on exposed skin in as little as 5 minutes,” the weather service said in issuing windchill advisories in effect from 3 a.m. to 3 p.m. Tuesday and a windchill warning in effect from 3 p.m. Tuesday until 9 a.m. Thursday. BISMARCK, N.D. — An arctic wave has wrapped parts of the Midwest in numbing cold, sending temperatures plunging and prompting officials to close schools in several states on Friday, but forecasters say the worst may be yet to come. That’s a high of 2 degrees F, or MINUS 16.6 C.
Even harsher weather is expected next week. Bitter cold as bad — if not worse — than the 2014 polar vortex outbreak is expected, as frigid air escapes the Arctic in two icy excursions into Canada and the continental U.S., according to Ryan Maue, a meteorologist for weathermodels.com. As my Son is living in Chicago now, I tend to pay attention to when his walk to the train station can be damaging. The good news is his employer will let folks work from home on the dangerously cold days. Also, being on the shore of one of the Great Lakes, the cold there is moderated a little compared to North Dakota / Minnesota and other inland areas. It is definitely cold outside in the Midwest. Brutal cold will likely shatter dozens of records across the Midwest and Great Lakes, said CNN meteorologist Dave Hennen. Chicago’s daytime high – the high! 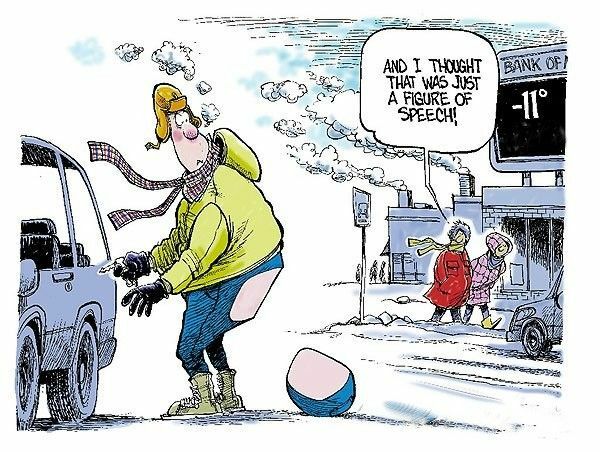 – on Wednesday is expected to be of around 15F below (-26C),” said Hennen. Nighttime temperatures will plunge to 20-40 F below zero. This entry was posted in AGW and Weather News Events and tagged Barney, cold, frozen, Midwest, Snow. Bookmark the permalink. The cold is hitting us here in Florida. Temperatures will be 60-ish F° and more likely to be in the mid to upper 50’s Wednesday and Thursday. Then it’s a fairly quick climb back to the typical low 70s F°. BUT… home base will see -10 to -15 F° so it’s hard to generate much sympathy for those of us shivering down here in Florida. Since I’ve been interested in the CAGW fuss for lo these many years, I take a mental inventory of the license plates on the motor homes and travel trailers. There are quite a few here from Wisconsin, Minnesota, Illinois, Ohio, Michigan, and Ontario CN. About 50% at this RV park are permanent residents of Florida (very affordable retirement living) so they have Florida plates. But during College Football Bowl season, you can see by the school flags they put out that they are just more of the same escaping the Northern climate. I am proud to admit that I am a climate refugee. If I took a poll of those staying here, I’d imagine there is strong support for global warming so that we could all go back home. There are already posts on various ‘boards’ including WUWT, saying that this severe cold is ‘what is expected from climate change’ !? In the mid-90’s, I was in Minneapolis for a business meeting in the deep winter. We got there a day or so after a cold front, with temps -20 or so, and the clearest, driest air I have ever seen. The sky was so bright a blue that it hurt the eyes to look at it. There was some question as to the ‘start-ability’ of the rent car as we were leaving. Fortunately, no problem, and we high-tailed it back to DFW, with 60-degree warmer air on landing. @Ian W: You can also expect dogs to take a dump and a whiz more frequently in your front yard due to climate change. I’m sure there’s a study on that somewhere, and of course it’s worse than we thought. P.S. If perchance you gained a couple of pounds over the holidays, you can blame climate change for that, too. There’s a plus side to blaming everything on climate change. Yeah, I can see Barney in that! Hmm. I remember some fronts that would fit that description, in Winter and in Spring. IIRC, there was one around Christmas time in ’88. My wife picked me up at work in Houston’s Greenway Plaza mid-afternoon, and it was 82F. Heading toward Dallas, we met the _very_hard rain (had to pull over under a bridge) starting at Huntsville. Not long after that, condensation started to form on the windows… they were getting cold. Sleet began to fall, slowing us (all) down, and by the time we reached Corsicana (fave McDonald’s stop with the kids in those years) we saw icicles on the roadside trees, and the Northern side of the trunks glistened with accumulating ice. When we arrived at my wife’s brother’s house for dinner, it was 7F. Arriving at OK City late that night, it was 3. February 1899 was remembered for generations as being the coldest month in American history, particularly on the week of Valentines Day when more than 100 individuals froze to death and nearly every single state in the Union recorded sub-zero temperatures. This will amuse you…. UCL in London are saying that the reforestation caused by a lot of people dying in the USA caused the Little Ice Age because the CO2 level dropped by 7-10ppm. They are saying that’s not the only cause, and that natural variability had a part in this, but that the CO2 reduction caused half the temperature reduction. Don’t grow more trees! It’ll bring on another Little Ice Age! AFAIK there is actually more forest now than there used to be at that time, with a reduction in the tropics and more in the temperate zones and above. I think maybe they may have misread some timestamps somewhere. Looking at the GFSV2 model, the deep cold is going warm a bit, due to southerly winds from a storm. Just in time for a cyclonic storm that has been dropping precip on southern AK and BC to shuffle through Seattle tomorrow, and then settle in offshore of San Fran on Saturday, drenching LA in the process. The low arrives over SanFran proper very early Sunday, and the associated Southerly flow and storms extend all the way from the Mexican to Canadian borders. Meanwhile, a significant ocean storm tracks out from the East Coast, pushed by a very cold front. By Wednesday next week, as the next wave of supercold arrives in Montana, the Dakotas, Iowa and Minnesota, the Atlantic storm patterns wend their way through the gap between Europe and Greenland, and take their heat all the way to the North Pole to escape to space. Look for specious references to the ‘Arctic Heat Wave’ to show up in publications then. At some point, 12 or 13F at the pole, and simultaneously -26 in Bismarck. Son, in Chicago, reported frost on the windows…on the inside…. Watched the Chicago TV News on the Roku. NBC 5. It was interesting. Amtrak canceled, airports shut, electric light rail closed, freeways jammed with accidents. Essentially Chicago shut down. Ah… yes… humans control nature and the climate. OK, then. Will somebody find out who is in charge and have them do something about this? And I want it done now dammit! It would be interesting to find a remote non-urban reporting site which has a long high quality temperature record to see if that trend disappears in a non-urban location. Perhaps a small island in the great lakes or Alaska where the infrastructure is very similar to what it was a hundred years ago. I notice that in the “hair graphs” I did back about 2009 ish. It was the lows rising (and not all that much) while the highs didn’t get higher. It is one of the issues I want to approach again in this newer round. IMHO it comes from a couple of things. 1) UHI. Folks now plough the roads and remove the snow then run a thousand cars over it all churning a few 10s of kW of heat. Take Chicago: 2.7 Million now, 10 million in the “combined statistical area”. If only 1/2 of them commute, 30 minutes each way so 1 hour, in a car making 20 kW / hour, that is a combined 27Million kW-hrs / day of heating just from the commute, at the low end. 100 Million kW hours at the CSA level. 100 BILLION W-hrs matters, IMHO. Urban area is about 5.5 k km^2 or about 5.5 x 10^3 x 10^6 m^2. So that ends up as 100×10^9 / 5.5 x 10^9 or 100/5.5 W/m^2. Or 18 W / m^2 of heating. (assuming I’ve done my math right). I thought we were supposed to be worried about a few mW of “global warming” / m^2. Doesn’t 18W/m^2 matter? Eh? 2) Airports. A LOT of the data are from airports. Airports grow over time. What, in 1910 was a grass field becomes 5 miles on a side of cement and tarmac in 2018. Then the pilots want the temperature OVER THE RUNWAY for “density altitude”. I.e. “can I fly or do I crash?”. Not in the grass or woods 100 yards away. I remember a local airport relocating the thermometers back nearer the runway and telling the “climate guys” to go stuff it (after they had moved them to a “better” area near the airport but not near the runway). The data are hopelessly polluted by two competing needs: Temps over concrete and tarmac so people do not die in a horrible crash; and temps in the grassy area a mile away. The “bottom line” is that we have maybe 1/2 dozen thermometer records long enough from places that have not urbanized and have not been growing airports. That’s not enough to say much about ‘Global Warming’ other than that they do not show warming. Urban cores can show 2-8 C of warming from UHI, and the 1/2 C of “Global Warming” comes from “averaging” that all together.